Mix traditional gifts, honeymoon funds, experience gifts and charity donations. All on one registry. A beautiful, all-inclusive registry for any occasion. Just a one-time $30 fee. Keep everything in a single list. This means mixing traditional gifts with honeymoon contributions, gift cards, experience gifts and charity donations. Add from any online store, in any currency. You have limitless options with the "Add to Thankful" browser tool. Just make sure the stores you add from can deliver to your address. You suggest stores where guests can purchase, but they're not locked in. If they find a better price elsewhere or would prefer to buy in-store, they can do that. No advertising and no extra fees. We promise no extra fees beyond your one-time $30 payment. Though if you opt to receive cash gifts by credit card, a small fee applies. Learn more. Your registry can be 100% private. You have the option to set a password so only invited guests have access. And your registry won't appear in search results or online wedding directories. 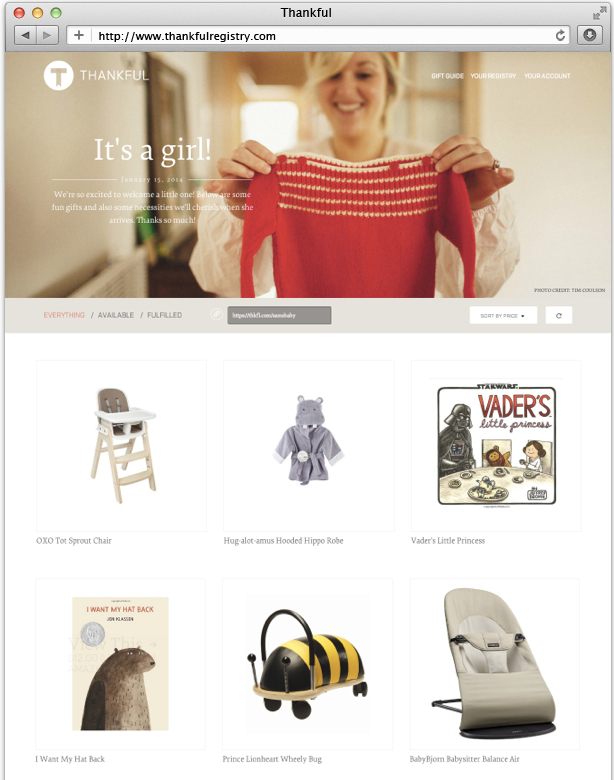 After the big day, turn your wedding registry into a holiday wishlist or baby registry. The one-time fee means you can keep it as long as you like. Thankful lets you add gifts from anywhere while also showing support for the causes you care about. Feel free to request charitable donations to any non-profit you'd like, or choose from the US-based ones we've featured in the "giving back" section of our Gift Guide. 100% of donations from your guests will go straight to the cause. Open a trial account and choose your unique URL. Upload an amazing cover image for your registry. 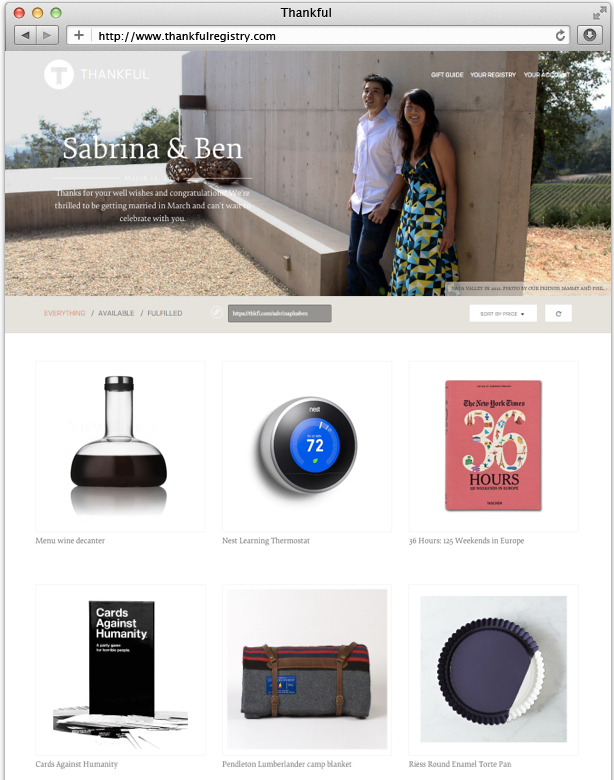 Install our bookmarklet to add gifts from any online store. See our Gift Guide if you need some extra inspiration. Fill in your shipping address, event date and welcome messages. When you're ready, share your registry link with guests! © 2012 - 2019 Thankful Group LLC | Read our Terms & Privacy Warm thanks: Photos by Andrew Thomas Lee.